The Polished Bookworm book for March was Gone Girl by Gillian Flynn. I thoroughly enjoyed this book. It was pretty suspenseful and I was reading every chance I could get: while I was brushing my teeth, walking in to work, lunch break, before bed. Part of the suspense is in the format. One chapter is written from the point of view of the husband, Nick, while the next chapter is narrated by the wife, Amy. They switch back and forth throughout the whole story so I was always wondering what was going on with the other one. I don't want to give away too many spoilers in case you haven't read it yet. 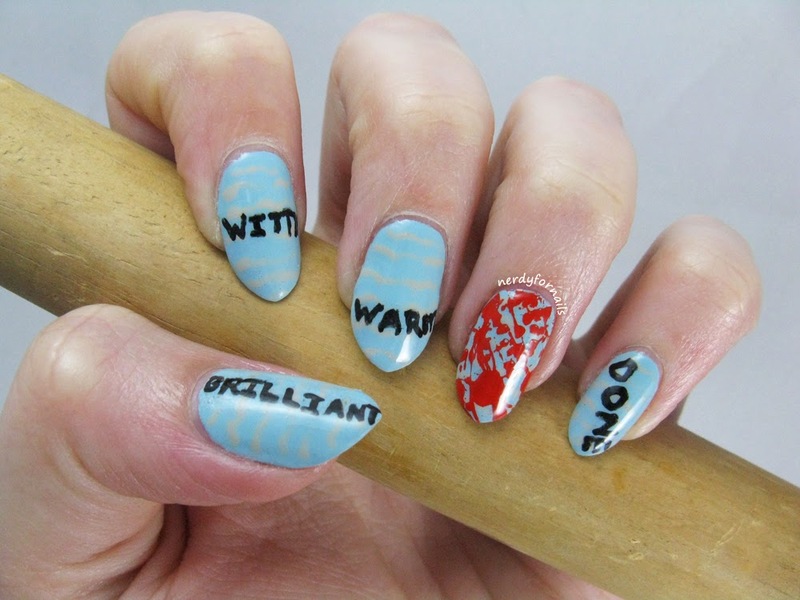 As much as I enjoyed the book I had the hardest time coming up with an idea for my nails. In the end I went with the love notes Amy left for Nick with her scavenger hunt clues. I painted blue nails for Amy's signature stationary and used her bold words that comforted Nick so much at first and later taunted him when he found the last one- DONE. The blue is two coats of Wet n Wild, I Need A Refresh-Mint. Not sure why this one has mint in the name since it's definitely blue. I hand painted the words with black acrylic paint and stamped on the blood splatter using Bundle Monster plate BM-416 and Mundo de Unas red stamping polish. I also painted on some grey squiggly lines meant to look like love notes at a distance with the bigger words jumping out. Meh. It didn't turn out how I'd pictured. This book was so complex and full of mind games. I can't wait to see how everyone else interpreted it onto their nails. There's a commercial on TV right now for a certain phone company that features a song about narwhals. Upon seeing this commercial the song became lodged so deeply in my brain that even my cat got tired of hearing me sing it. For days. Seriously.. so many days. My theory seemed to work out pretty well last time. 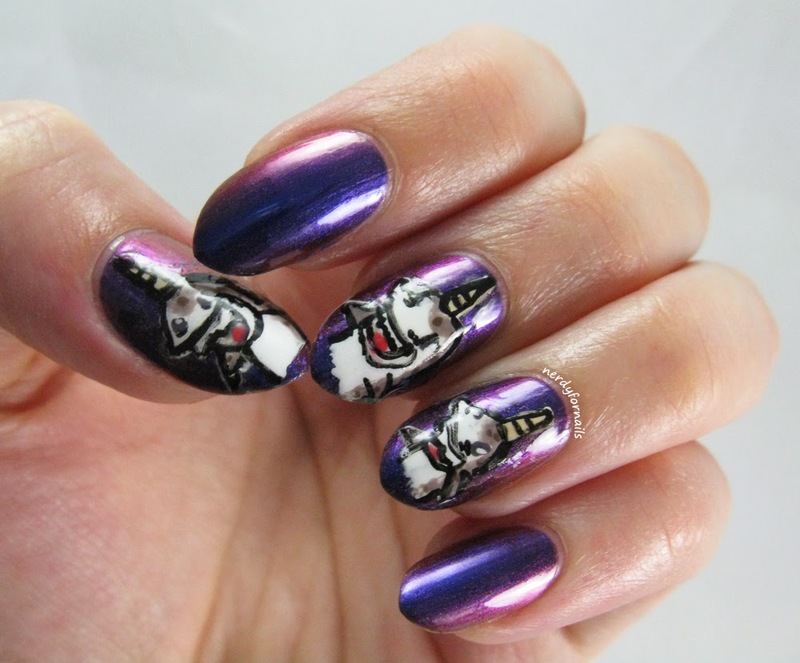 If something is stuck in my head I can paint it to get it out, so here are my narwhal nails. If you haven't heard this song yet I've included the video for you. You know you can't resist watching it. So, what did you think? Will you now also be singing this over and over in your mind until you go crazy? 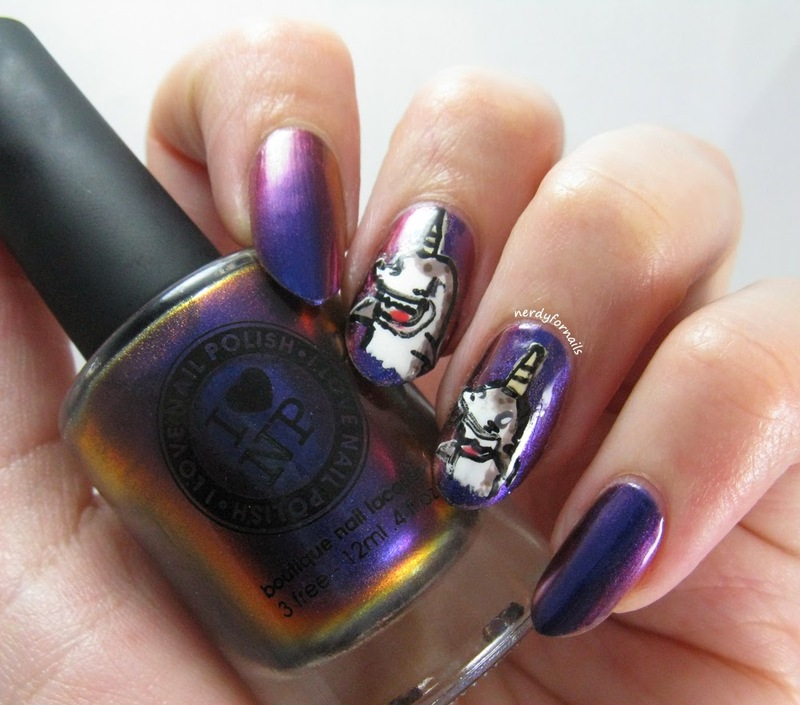 My narwhals are swimming in an ocean of I Love Nail Polish's Cygnus Loop. I absolutely love their multichromes. This is the third one I've tried and they all have such beautiful dimension and shift. This one goes from a rich blue/purple to a bright violet/pink with some hints of gold at the edges. The formula can drag a little so you'll want to do 2-3 thin coats for good coverage and use as few brush strokes as possible. The extra care needed is completely worth it. This polish has a great wear time an unbelievable color. 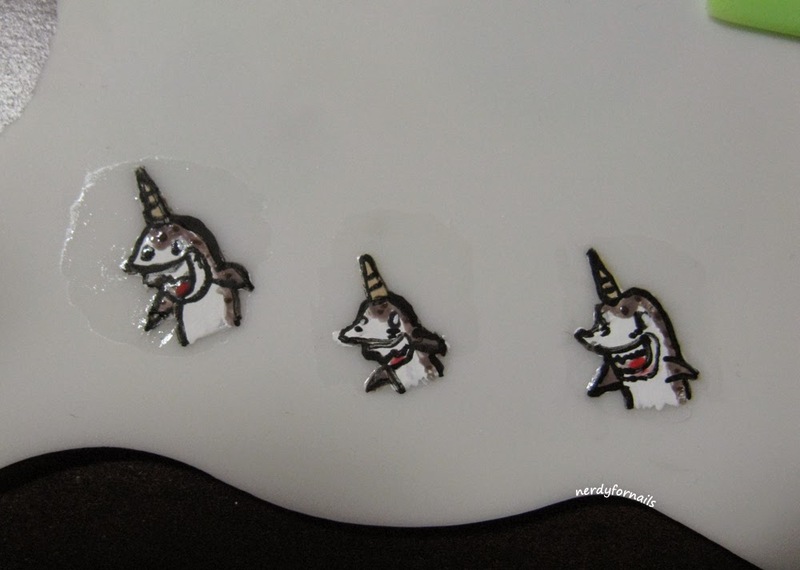 I made narwhal decals because I didn't quite trust myself to paint these perfectly onto my nail. I have a little silicone mat that's perfect for making decals. They peel off so easily once they're dry. I started by painting a white outline in the basic shape and filling it in. I went back with black acrylic paint to add the details and then filled in the colors last. I always seem to get bubbles when I apply my decals though. It's driving me crazy. Does anyone have any tips to avoid this? I wanted to do a close-up of the thumb but ended up leaving it out because there were so many bubbles it didn't even look good. How do you deal when annoying songs get stuck in your head? 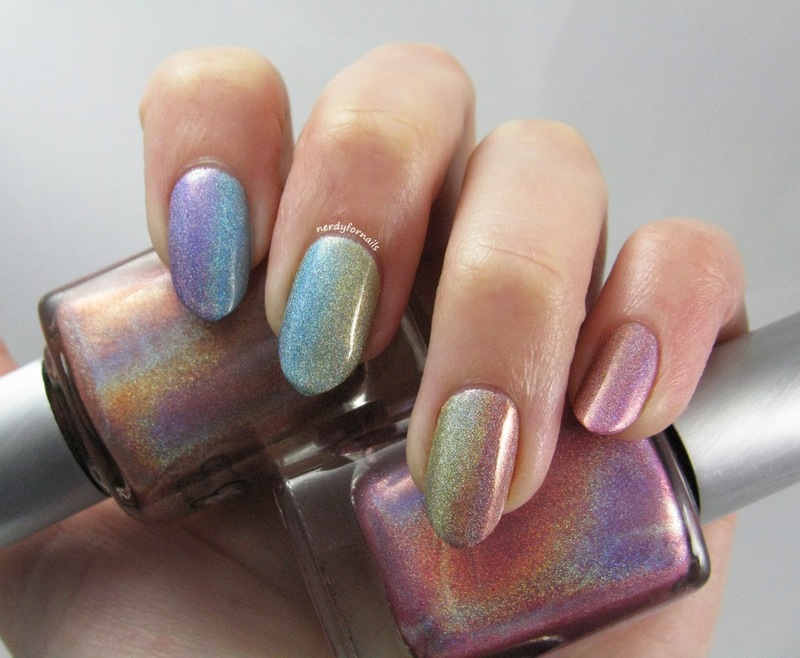 Double Rainbow... because rainbow gradient and holo rainbows. Can there ever really be enough rainbow? No. In case you were still wondering. For my last birthday my mom spoiled me and got me the Color Club Halo Hues collection. I put off using them for quite a while because I couldn't decide which one to use first. 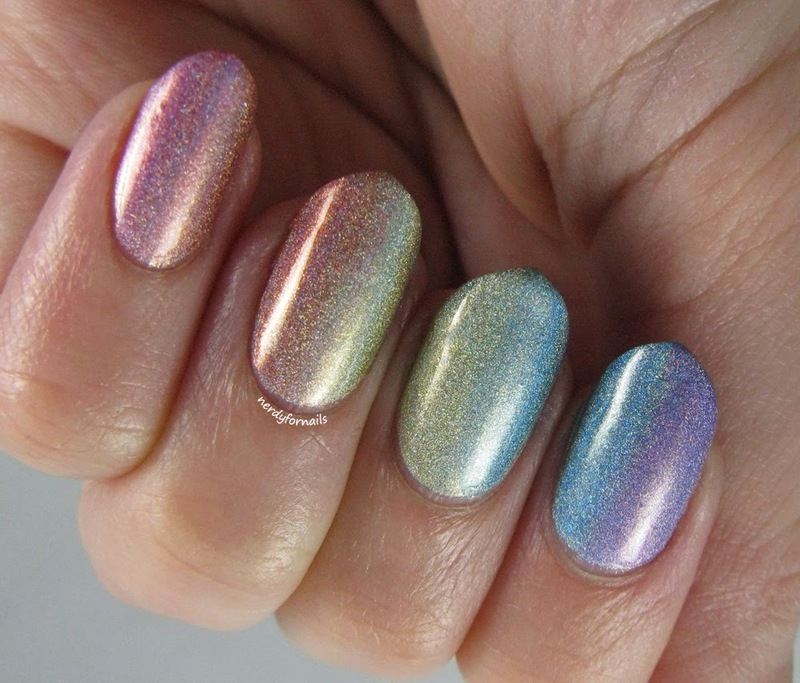 Nothing I came up with seemed worthy of the holo-tastic goodness until this: the double rainbow holo gradient. 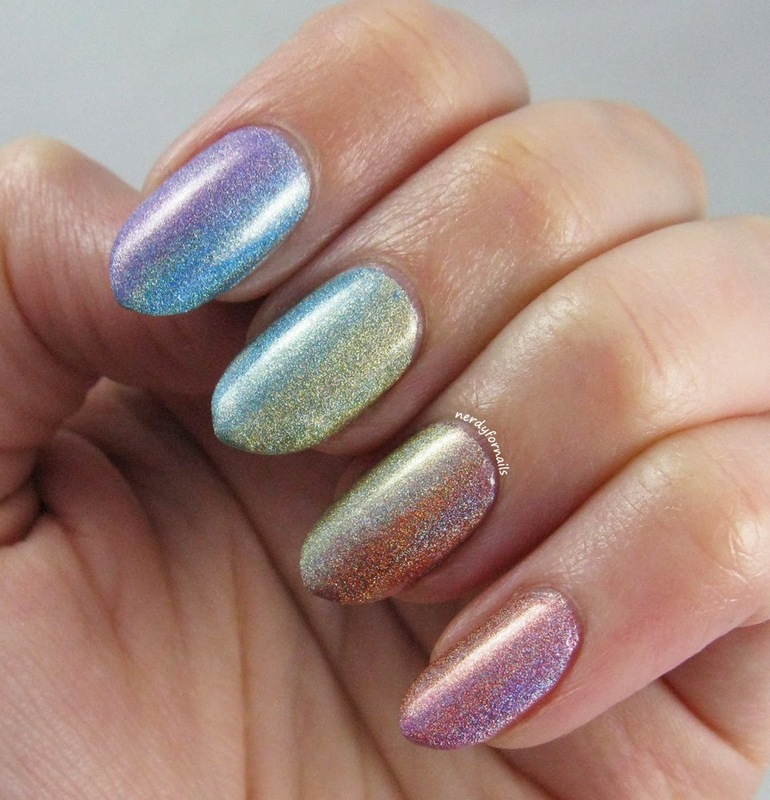 I used a makeup wedge to sponge on a vertical gradient across all the nails to create the perfect holo gradient. I started by painting each nail the lighter of the two shades and then painted that color plus the one to be blended onto the sponge. I had to repeat each sponging 3-4 times per nail to get the density I wanted, but it definitely paid off. I'm in love with this manicure. Because of my bad posting schedule these days I actually painted these about two months ago during the only week of year that we had no sun at all. 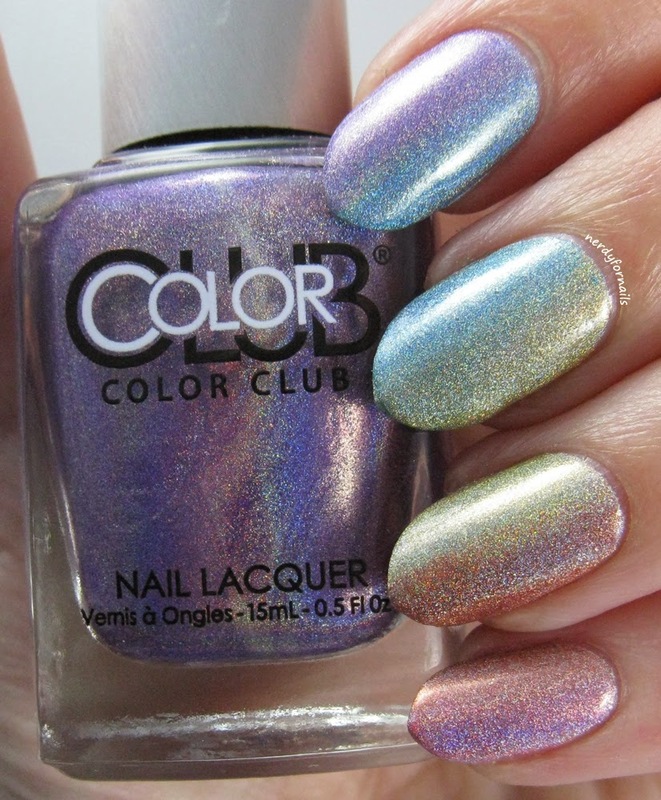 I'm really sad that my bad timing means no glorious holo sun photos. But on the bright side as I was writing this tonight my husband asks, "Are those your nails? Those are really cool." I love when something turns out good enough that I can almost ask myself the same question. Does this mean I've officially arrived as a blogger? Last year I got so excited about doing manicures for all the holidays, but I haven't been feeling it at all this year. I only did the Valentine's nails because I needed some stamping to cover up a manicure that didn't turn out the way I wanted, and I posted it late too. 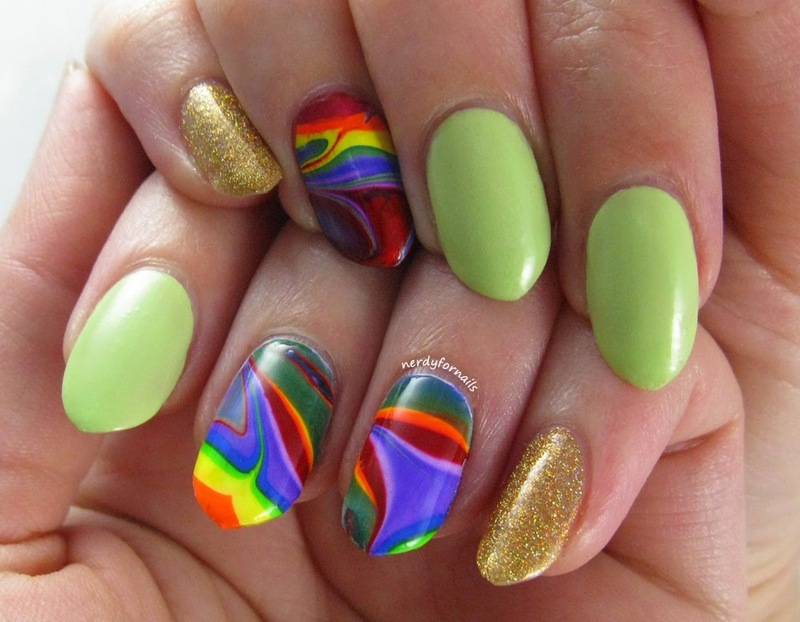 I wasn't going to do a St Patrick's manicure either, but then I had the idea of a rainbow water marble. And I dreamed about it on repeat last night. All night long. So of course I had to paint it today when I woke up. I mixed in some green and gold for this St Patrick's skittlette. The gold nails are Orly's Bling (full review here) and the green is a Sally Girl mini called Pea-Body. Love the color, horrible formula. It was watery and streaky. It took three coats to get decent coverage and was still dentable long after my other nails had dried. Here's a rare glimpse of the right hand. The marble came out cool so I thought I'd show them all off together. I still need some practice marbling, but it's getting better. I've got my corned beef and cabbage ready for Tuesday, but it'll be a nice quiet night in other than that. Are you doing anything to celebrate this year? I've had this song, I Am The Best by 2NE1, stuck in my head for days. It's used in a Microsoft Surface tablet commercial and I can't get it out. The rational thing to do was to look up who sings it and then watch the music video so many times that it burns out in my brain. Take that brain. Seriously though, the video is cool. It reminds me of the olden days when I was a teenager and Spice Girls were a thing. KPOP is just a slightly less intelligible version of Brit-Pop, and so catchy. 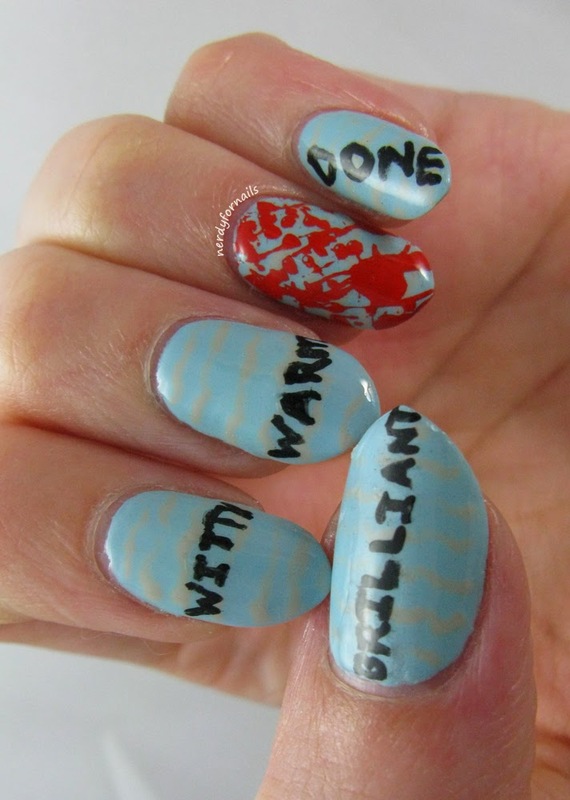 The video was also great inspiration for nails. 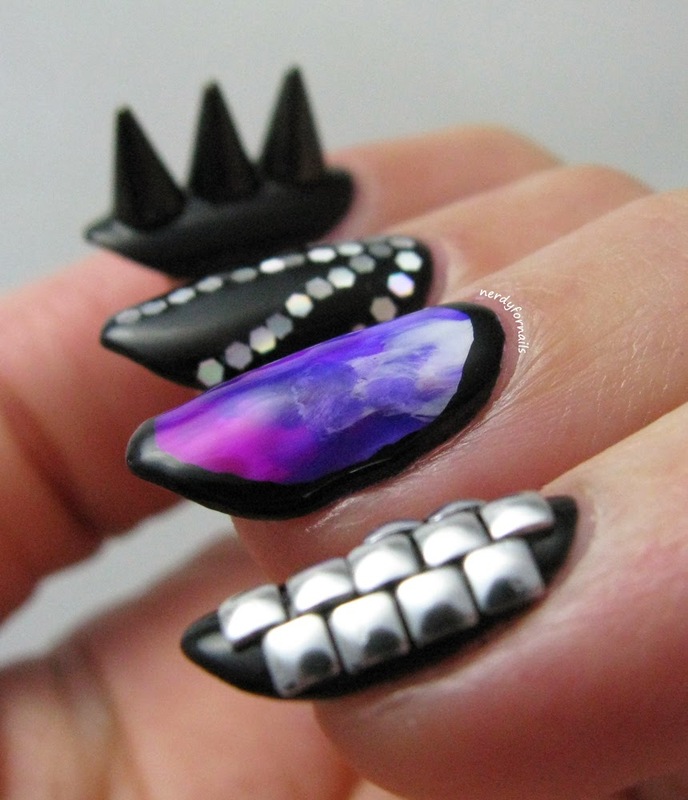 I grabbed screen shots from the video to show the parts that inspired these nails. I started out with two coats of Sinful Colors, Black on Black. 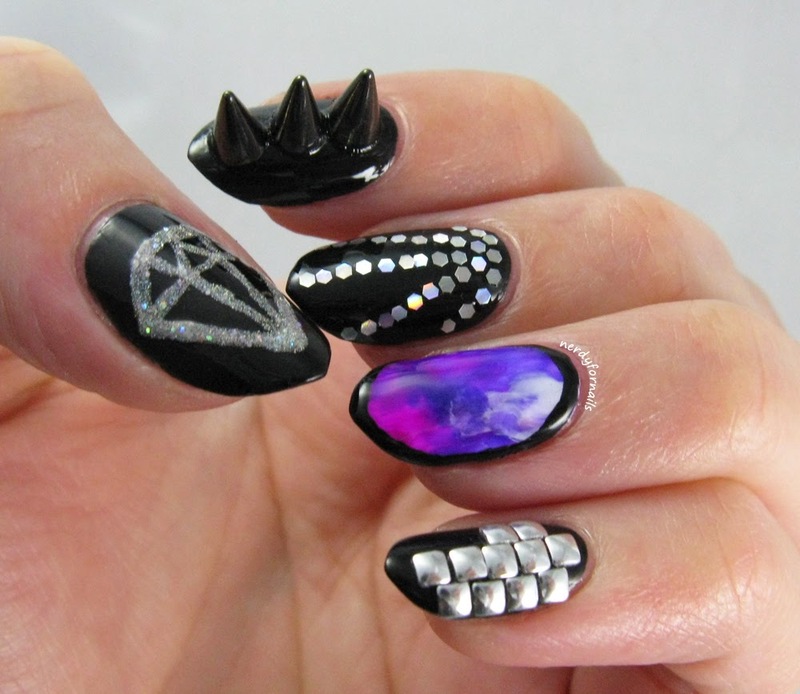 I hand painted the diamond using Orly, Mirrorball. 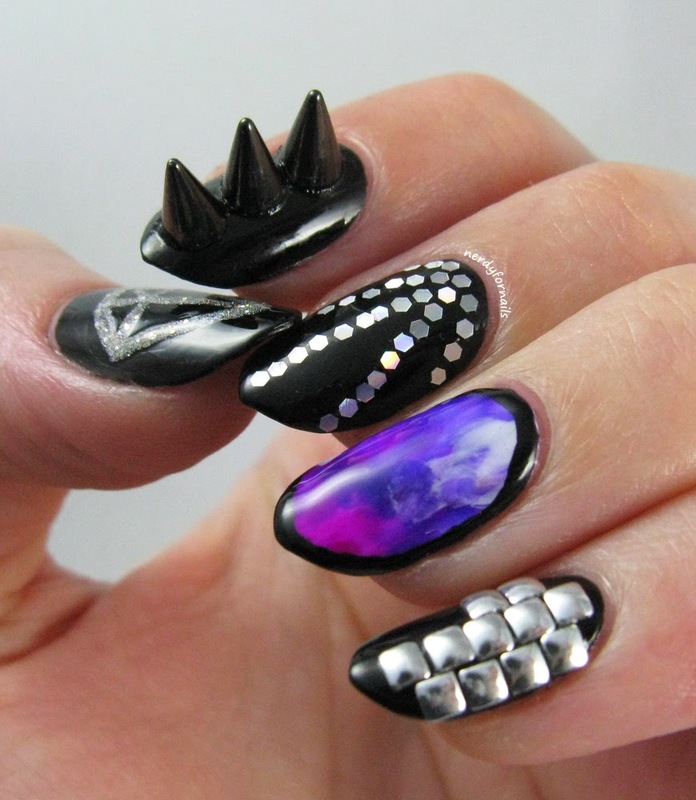 I used spikes that I got from Miss A to mimic the outfits the girls wear. And boy do they wear a lot of spikes. I attached these with super glue. They stayed stuck for a full three days until one popped off. If you're feeling adventurous try living three days with giant spikes on your index finger. I wonder how many spike-related injuries they had on set that day. 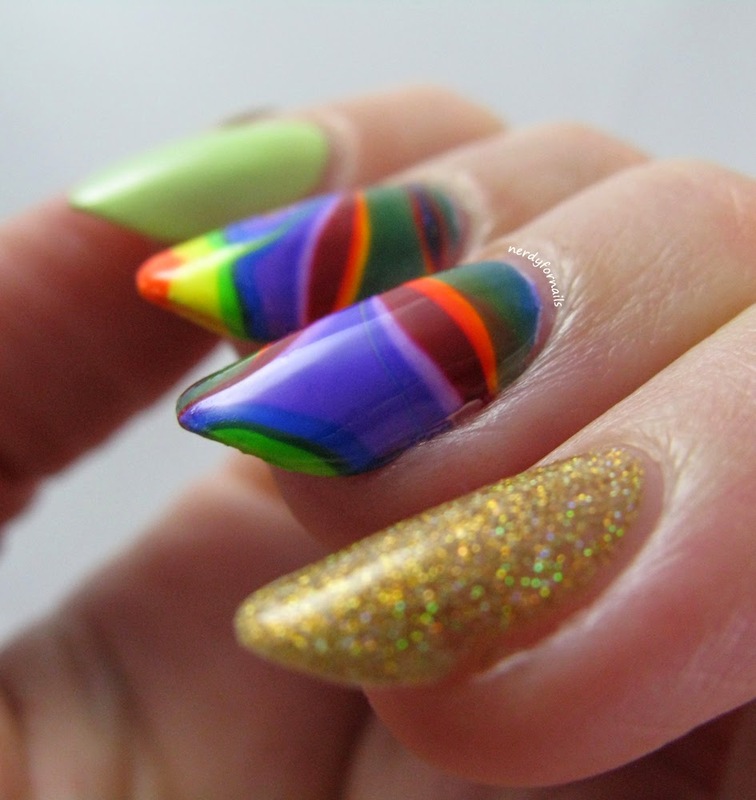 For my pyramid nail I used holographic glitters that I got from Born Pretty. 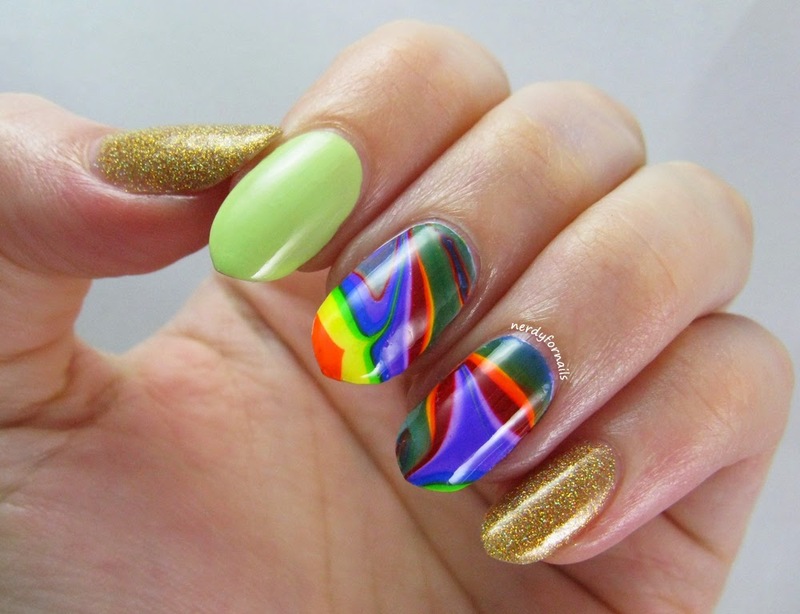 I used a toothpick dipped in wax to place them in lines on the nail. This one is my favorite. I started with a white base here- Sinful Colors, Snow Me White. The bright purple is Sinful Colors, Dream On and the dark purple is Orly, Saturated. I mixed blobs of the colors with blobs of clear polish to water them down a bit and then used a flat wide brush to paint them on, swirling the colors together on the nail. I also added a bit more white polish this way and the end effect was very soft like water colors. Last, I painted a black border to tie this nail together with the rest. My last nail is the stud covered globe-chair thing. I attached mini studs with clear polish in staggered lines. No way was I going to be able fit a whole continent on my pinkie. I love the way this manicure turned out. It was fun, if not a bit challenging, to wear and it definitely got some attention. I'm kind of liking this whole KPOP thing too. I'm not really familiar with it yet, so if you have any favorites let me know so I can check them out. I realized recently that my collection was lacking in reds. It's such a basic color that I overlooked as being too boring at first, but it's a classic color and I absolutely needed more of them in my collection. Moto was the last one to join my stash and I thought it looked a lot like Pepper so I had to find out just how close they were. And then why not throw in a couple more for good measure? All polishes are shown with two coats plus topcoat. Zoya's Pepper is the darkest of the shades and has a beautiful, easy to apply formula. I'm so glad I got this one in Zoya's last sale. 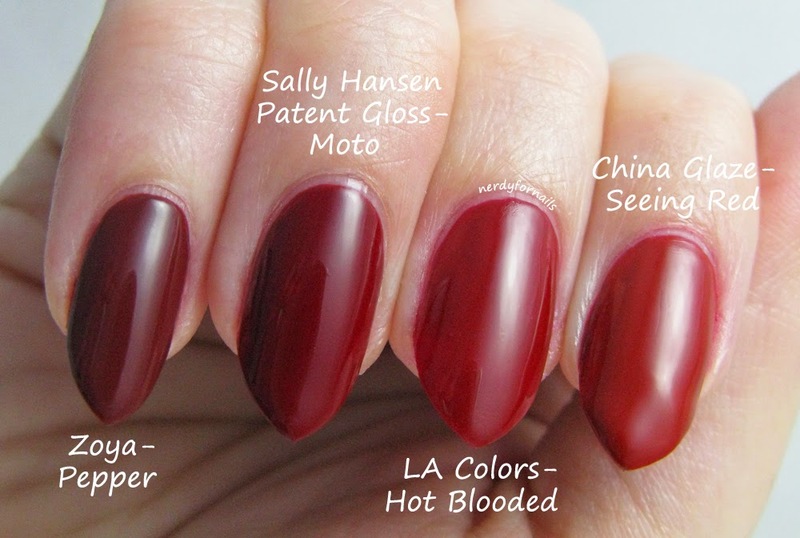 Next is Sally Hansen Patent Gloss in Moto. You can check out my full review here. It's nearly a one coater that has great coverage and shine. 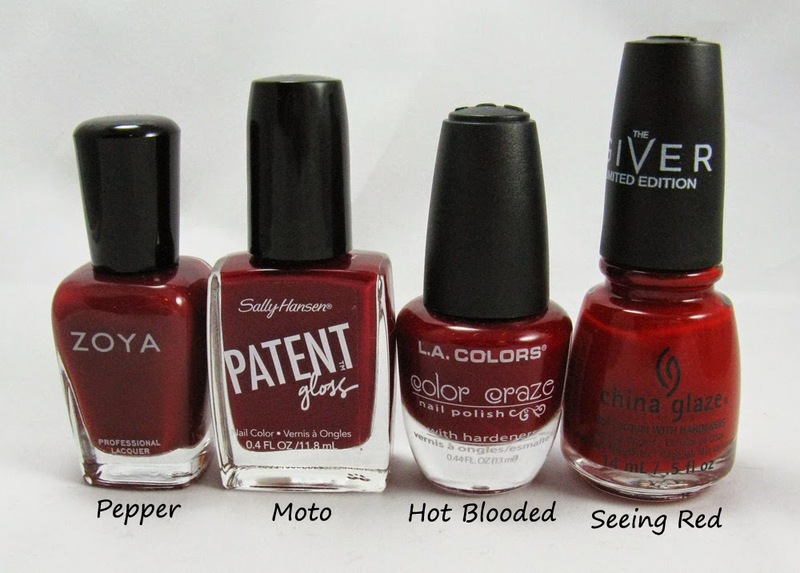 LA Colors Hot Blooded was the most finicky of the formulas. This one is a crelly so it took two coats to get full coverage vs the others which were creams and could get away with one if you were in a hurry. Last we have China Glaze, Seeing Red from The Giver collection. The one is the brightest of the four. It also has a fantastic formula. The tones of these four polishes are just different enough that I think it's worth keeping them all. There's just something about having red nails that makes me feel half classy and half trashy at the same time. Probably the length and points aren't helping to keep me off the trashy side, but I love it!